I love celebrations. Last week we celebrated the company’s 10th birthday with cake, champagne and jelly beans at all of our offices in the UK and abroad. It was a real joy to see happy smiling faces everywhere as we celebrated a decade of incredible achievement. On 9 June 2000, Betfair ran its first market on the Oaks at Epsom, where £3,462 was traded between 36 customers, watched over by just a handful of staff. Ten years later the company employs over 2,000 people spread across 30 locations around the world, and deals with more daily transactions than every European stock exchange put together. And for the next month we are celebrating the most amazing festival in the sporting calendar. We are at our core a sports betting company, so the World Cup is a big thing for us, and we have been preparing for it for years. It’s only fitting therefore that we have a bit of fun and pay homage to the 32 teams battling it out in South Africa. 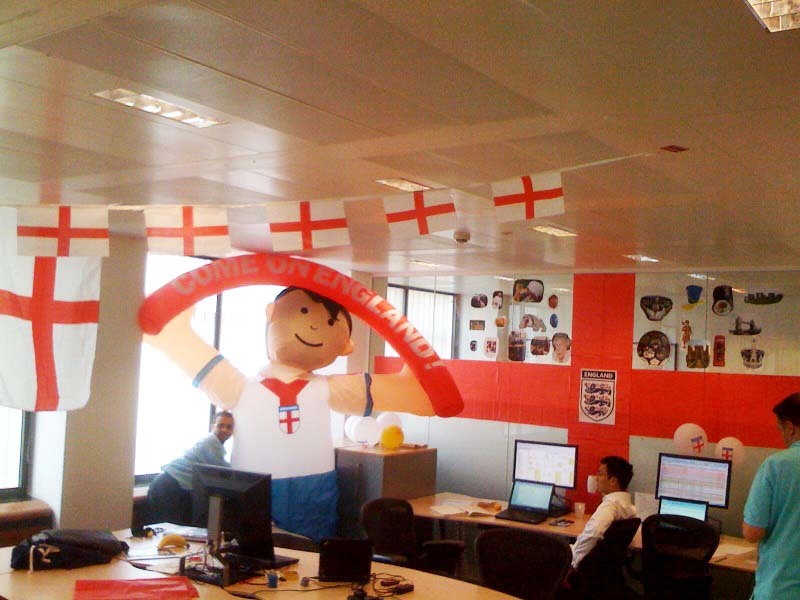 While the media are banging on about the cost to employers of World Cup distraction as staff absenteeism and lack of attention rises incrementally in line with England’s success on the pitch, and companies ban access to footy websites and make the flying of the Cross of St George a disciplinary offence, we have been encouraged to fly the flag – and more. 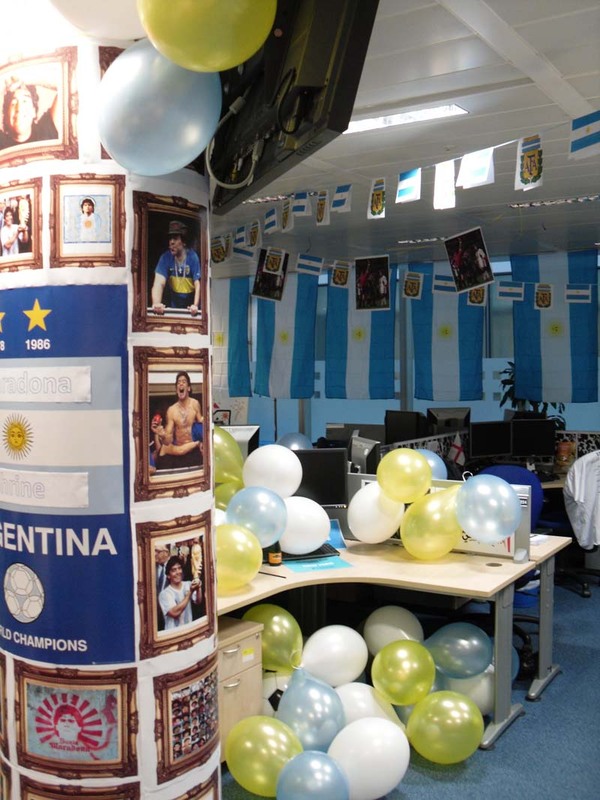 Our offices have become a sea of colour, creativity and noise to reflect the energy, excitement and diversity of the World Cup. 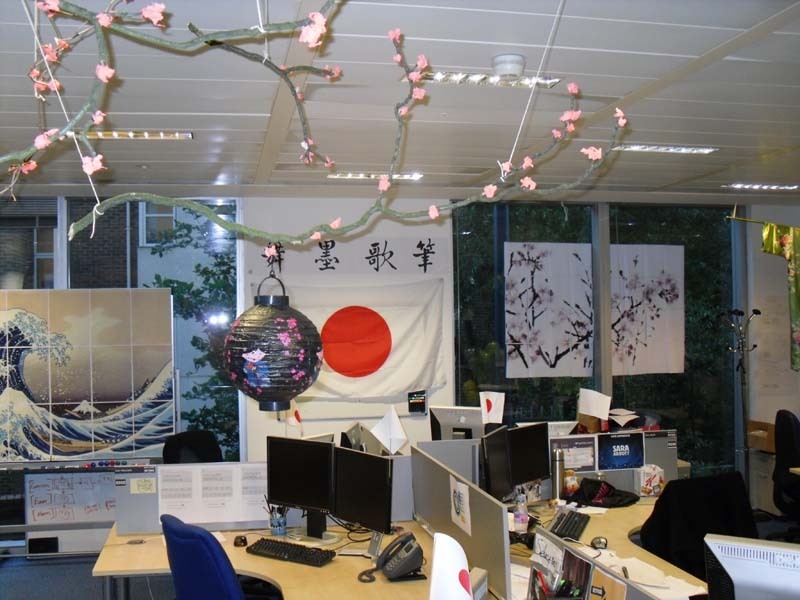 Our staff in London have self organised themselves into 34 teams and given their bits of the office a bit of a makeover. There are 34 teams because two non-qualifiers that narrowly missed out on a trip to South Africa, Ireland and Egypt wanted to get involved. My team is representing the Cameroon. 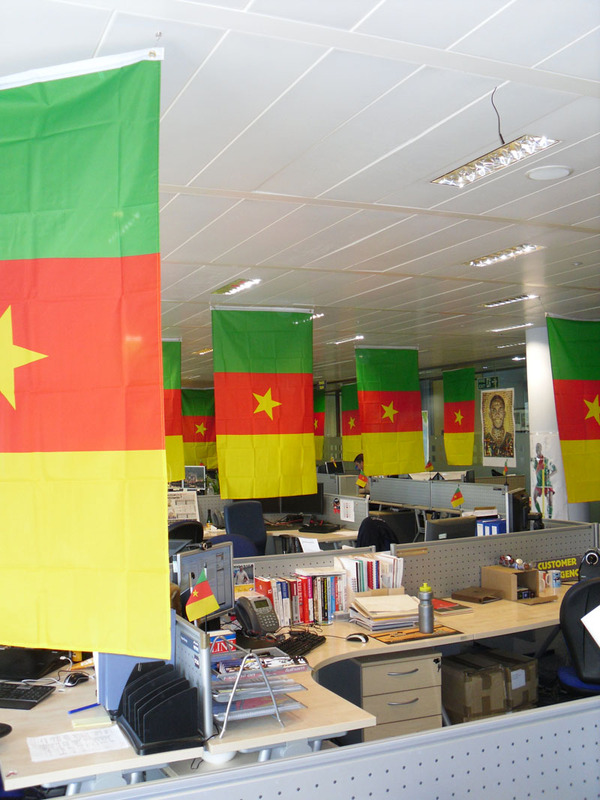 Which is great, because the Cameroon have a rich heritage when it comes to World Cup celebrations! 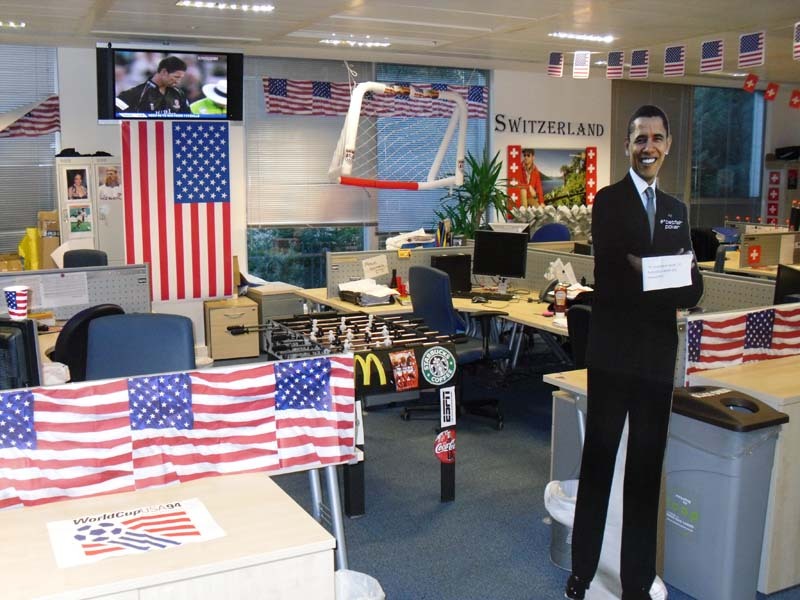 Don’t be fooled into thinking we are all just on one great big World Cup jolly. Au contraire, this is going to be a very busy month for everyone as we mobilise to meet the demands of dramatically increased customer activity. However, I work for a company that recognises the importance of celebration as well as the value of having a bit of fun while your nosed is pressed firmly against the grindstone. Don’t just sit there feeling hard done by – check out our current vacancies and get involved! I love Boris. Don’t assume from that I’m a Tory. I love Boris because I warm to politicians with personality and who don’t take themselves too seriously. Three days ago Boris wrote a piece in the Telegraph in which he took a swipe at an article in the Sunday Times titled “Gordon Brown on course to win election”. This possibly bold assertion was based on the results of a YouGov survey which placed the Blues on 37%, as against 35% for the Reds – the closest gap between the parties in more than two years. Boris playfully suggested an alternative equally implausible headline could have been “One-legged man on course to win arse-kicking contest” before suggesting that we’d be better off forgetting the polls and keep an eye on the bookies instead. “The reason I trust the punters of Betfair more than I trust a poll in a Sunday paper is that the punters have thought it through with the care of those investing their own money” barked Boris. This got me thinking about the reason why prediction markets appear to outperform polls. Is an opinion any more valuable when it is expressed through a financial interest in the outcome? I’m not convinced because as all Betfair punters know the margin between a good bet and a bad bet is very slender indeed. I and many fellow Betfairians often put money on the drop dead favourite not winning the race (or game) as the odds can be very attractive. This is commonly known as laying the leader. It does not mean I believe the favourite won’t win by the end of the race, it simply means fluctuating fortunes (and therefore odds) are likely to present me with opportunities to trade my position profitably before the race finishes. By the same token, it can therefore often pay to back the one-legged man to win the arse-kicking contest at very long odds because we have seen time after time that the implausible has an alarming albeit occasional propensity to take us by surprise. Poker is an interesting game. Anyone who plays Texas Hold ‘Em seriously will know that fun money or friendly games just don’t work. In order for poker to work properly the element of risk is required. Without risk it is simply a game of luck and the person with the best cards will win any given hand. I guess this in a way supports the notion that predictions based on a financial stake are more accurate than simply asking someone for an opinion or voting intention. Anyway, regardless of the merits of prediction markets versus polls, I doubt one can argue against a combination of data from both providing the ‘belt and braces’ solution to predicting the outcome of the forthcoming UK General Election. And that is exactly what Betfair has done in partnership with leading research agency ComRes when it’s excellent new Election Predict 2010 website launched yesterday.